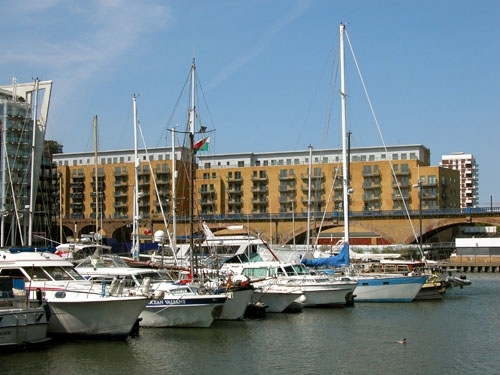 Limehouse Marina is located to the East of London, and connects the River Lee (via the Limehouse Cut), the Regents Canal and the River Thames. This is an ideal location for all river, canal and sea going pleasure craft. The 90 berth marina with excellent modern facilities is an oasis of calm in London. 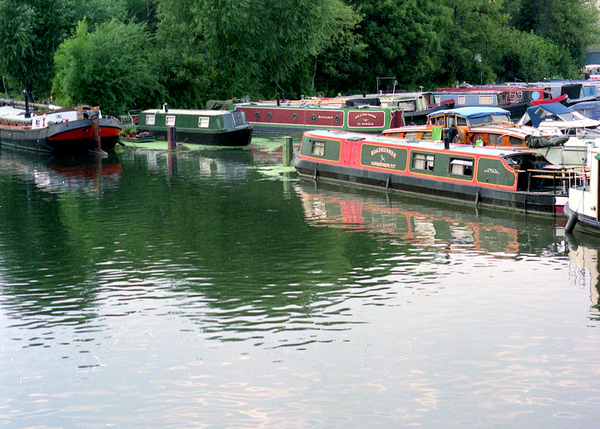 The marina makes a perfect base from which to explore London and the surrounding waterways. Springfield has been owned, operated and developed as a Boatyard/Marina by the Lee Valley Regional Park Authority since the late 1960’s, when it was purchased by the Authority from the Radley family. In the Authority’s records it is noted that the Radley family had owned the site since the early 1890’s, however, it is unlikely to have been operated as a boatyard initially. 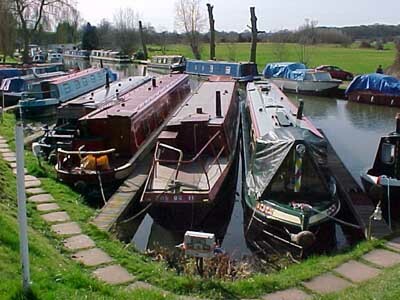 The transition to a yard with moorings is locally reported as being around the 1930’s. 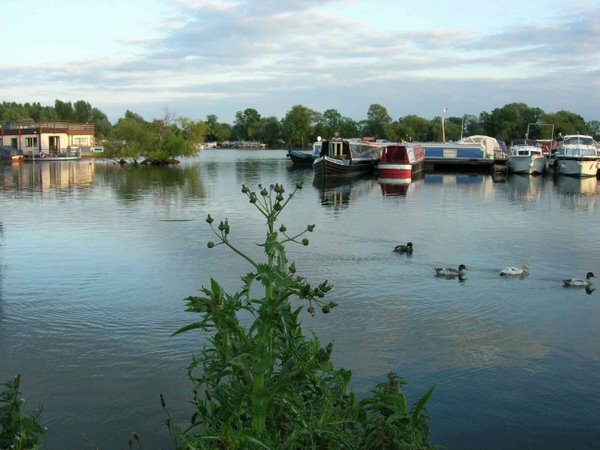 Sited on the lower reaches of the River Lee adjacent to Walthamstow Marshes, a Site of Special Scientific Interest (SSSI) and a Nature Reserve, the Marina has some 200 berths and is close to the City of London and the West End. It is ideally placed for cruising the Canal Systems and the River Thames and River Lee. The Marina is more than adequately served by public transport. Located in the heart of the beautiful Cambridgeshire countryside, conveniently close to the main towns of Huntingdon and St. Ives, Hartford Marina offers you the perfect location for mooring your narrowboat or cruiser. 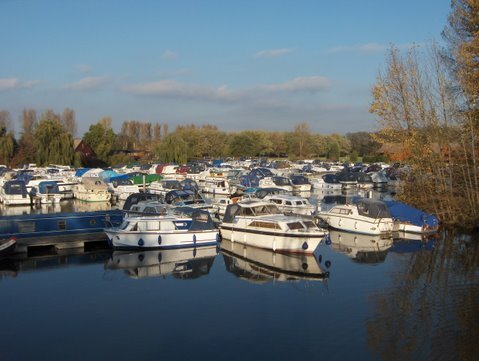 Situated on the River Great Ouse, with excellent travel links by road (A1 and A14) or rail to London, Cambridge and Peterborough, our marina offers the perfect blend of tranquility and convenience. 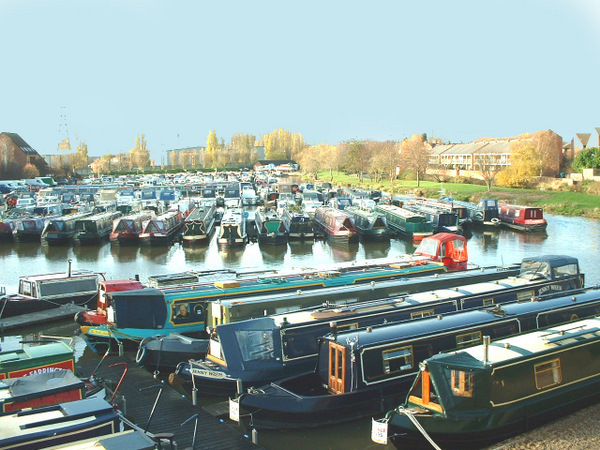 We offer a superb range of services for our customers, from a well stocked chandlery and expert boat brokerage service to the onsite engineering services of Riverboat Solutions as well as a Pub and Restaurant – the Hartford Mill which provides beautiful views of this stunning marina complex. Our location makes us the perfect access point to experience this superb stretch of river at it’s best, no matter whether it’s for a day, a month or a lifetime. If you’d like to know more about any of the services we offer, then please contact us to discuss how we can help you make your boating experience the best possible. On the banks of the River Great Ouse, between St. Ives and Huntingdon, Hartford Marina was developed from a defunct gravel pit in the early 1960s by two developers called Scrivener and Rhodes. They were forward thinking businessmen who produced an attractive marina and were soon doing well selling Seamasters and Freemans cruisers which were so popular on the river at that time. The building that is now a large workshop was then a showroom full of new boats for sale. Yule Cato who owned two other marinas later bought the marina. In the 1980s it became part of the MDL group, which was then run by Barry Perry. MDL had expanded from their base of coastal marinas to inland sites but later changed this policy and withdrew from the inland market. At this time (about 1986) Barry was departing from the company and as Hartford was his favourite marina in he bought it from MDL as a place to live and a business to run. Barry Perry developed the moorings, the chandlery and built the Hartford Harnser – a range of luxury wide beam riverboats from 36 to 46 feet long. He also introduced houseboats into the marina. Scott Deverall is now the Managing Director responsible for the day to day operations while Barry Perry remains the major shareholder and takes an active interest in the development of the site, the houseboats and the land based housing development now underway. Scott has been at Hartford Marina for 12 years. He studied yacht manufacturing technology and marina management at Southampton where Barry was one of the course moderators who did exam marking and offered work placement places to students. Scott did about six months at Hartford on one of these placements around 1990 and got on very well with Barry who said if he had a position vacant he would be willing to offer Scott a job. Scott left college at a time when the marine industry was in recession and jobs were difficult to find. He was lucky enough to find a job selling boats on the south coast when one day he unexpectedly got a call from Barry offering him a job as Marina Manager. He was about to get married and as the offer included the opportunity of having the flat above the marina office he found both his work and housing problems were solved. About two years ago Scott was offered a share in the company and became Managing Director. The marina is home to a very diverse collection of boats; cruisers, an increasing number of narrowboats, Dutch barges, wide beam steel boats, sailing dinghies and other small boats as well as houseboats. The houseboats are one of the more unusual aspects of the marina and stem from Barry Perry’s idea to use the marina’s ample mooring space and the observation that many people spend a lot of time just living on their boats and do relatively little cruising. Houseboats give much more living space and have mooring for a cruising boat alongside. Soon after the first houseboat was built and put into the water deposits were taken for six more, demonstrating that Barry’s concept was sound. The marina has diesel, petrol, gas, pumpout, a growing chandlery, an expanding boat sales office, two toilet and shower blocks and a launderette. They are also one of the few inland marinas to offer broadband wireless access to the internet, in this case through Square Mile. They provide boat repair facilities, doing steelwork repairs but not major replating. They can lift boats up to 52 feet long using their flat bed trailer and for larger boats at present they bring in a crane but are developing a gantry system for lifting bigger craft. They also do fibreglass repairs and fitting-out. 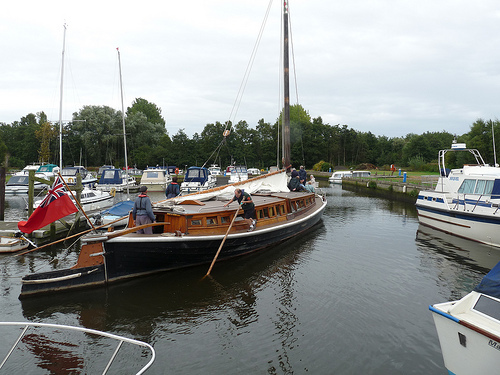 When I was there they were fitting out a wide beam steel boat bought from the New Boat Company as a sailaway. This work is done by Chris and Nigel Markwell who have long experience as boat builders and marine engineers and operate as sub-contractors working exclusively for the marina. Nigel does all the woodwork and Chris does the engineering, electrical and gas work. The marina sells about 70 boats a year through their brokerage plus a range of new fibreglass cruisers from Quicksilver. They also sell small inflatable, plastic and aluminium boats. They are dealers for a number of engine manufactures to match the variety of boats using the marina; Mariner outboards, Nanni Diesel, Mercruiser, Shire and Yanmar Marine.